Accuracy and simplicity are the hallmarks of Bee Line’s revolutionary Smart Balancer II, the latest generation of touch screen computerized systems that balances wheels on the vehicle. 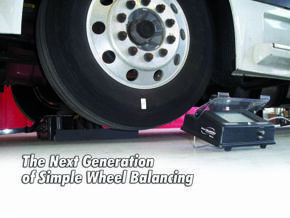 On-the-vehicle balancing refers to the Truck Maintenance Council’s official recommended practice of truck wheel balancing. On-the-vehicle means the wheel is never removed from the truck during the balancing procedure. By leaving the wheel on, a technician not only balances the tire, he balances the hub and the drum in relationship to the truck’s suspension. Balancing the entire wheel assembly provides a far more accurate “smart” balance. With a few short spins of the wheel, the touch screen illustrates the exact amount of weight and location where it should be added to the wheel, dramatically decreasing the time it takes for a complete balance. With the Smart Balancer II, you make more money with a better quality balance in less time.